Octopus is a tasty, healthy, lean seafood that can sometimes be tough when cooked. By tenderizing the meat before cooking and then cooking the octopus in its own juices, you can break down the tough muscle fibers and preserve the juiciness of the meat, resulting in a moist and tender meal that isn't chewy. Cooking with previously frozen octopus does not result in a tougher finished product than working with fresh octopus. Thaw octopus by placing the frozen meat in a large bowl and covering the bowl with a wet paper towel to lock in moisture. Let the bowl sit in the refrigerator all day or until the octopus is completely thawed. Mix a handful of kosher salt into a large bowl of cool water, using enough water to cover the octopus. Place the octopus in the bowl, and refrigerate the octopus in the brine for five hours to break down muscle tissue. 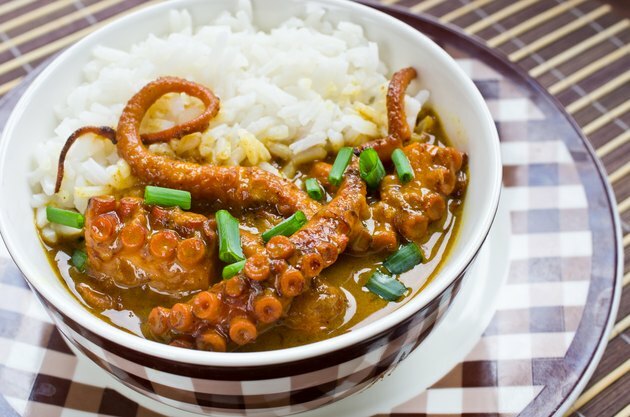 Bring a large pot of water to boil, and blanch the octopus by dipping the entire octopus in the simmering water for about 3 seconds. Repeat the dipping process three times. Braise the octopus slowly at low heat to improve the tenderness of the meat. Place the octopus in a large pot covered with any braising liquid, from water to red wine. Alternatively, place the octopus in a dry pot and allow the fish to cook in its own juices. In either case, place the pot in an oven preheated to 200 degrees F and braise the meat for four or five hours. Remove the octopus from the oven as soon as it is done to avoid overcooking, which can lead to toughness. Check for doneness by poking a sharp knife tip into the meat. Pull the octopus from the pot when the knife tip meats slight resistance.